Michael Gorman, founder of Scarlet Ibis Fly Fishing Tours, Inc., has been guiding and teaching effective fly fishing skills for more than 30 years. His angling knowledge and skills have been honed in New Zealand, Ireland, Christmas Island, the Bahamas, Florida, Alaska, British Columbia, and all over the Western United States, including Oregon's world-famous Deschutes, Rogue River, McKenzie River, and North Umpqua Rivers. Michael Gorman, a professional guide of more than 30 years helps us make the most of every stillwater fishing outing - even those ego-bruising days when the fish seem to reject everything. Join us to learn Michaels strategies, techniques and secrets. He owned and operated his own retail fly fishing shop in Corvallis, OR for many years, also being the head fishing guide. Michael continues, still, as an Oregon fishing guide throughout the calendar year, in addition to teaching classes at Oregon State University, where he has done so since 1987. 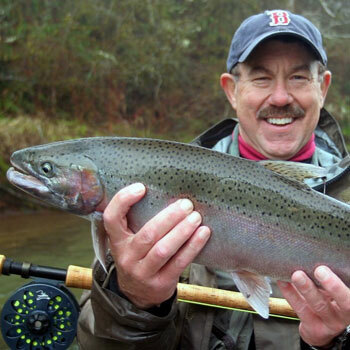 For more than 25 years he taught credit fly fishing classes at OSU. As a professional fly fishing guide throughout the calendar year, Michael focuses his efforts on McKenzie River trout and selected stillwaters spring and summer, summer and fall steelhead on southern Oregon's Rogue River, and winter steelhead on the central and north coast. In addition to authoring Effective Stillwater Fly Fishing, An Analytical Approach to Help You Catch More Fish (Stackpole Books), he also wrote Steelhead Fly Angling, Guerilla Fly Rod Tactics (Frank Amato Books). Currently Michael is finishing up a third book on nymph fishing. Check out his YouTube channel MichaelGormanFlyFishing for a a variety of fly fishing topics. For more information contact him through his website www.GormanFlyFishing.com.